COMPASS offers a full suite of Android support, security and customisation software and services, engineered for the enterprise environment. 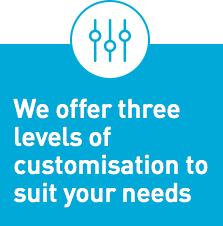 Personalise your user interface, improve signal quality, battery power, security and storage space, and manage apps more efficiently. Cost of customisation dependent on project scope. Staging options and pre-installed Enterprise Mobility Management (EMM) / Mobile Device Management (MDM), certification and licensing, for easy rollout. A unique mobile enterprise application platform for building, deploying, running and managing custom software applications. 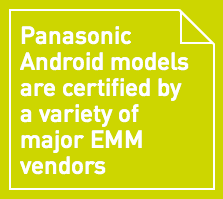 Upload your application for Panasonic to certify for use on TOUGHBOOK devices. So, you can ensure the correct app is running, and protect against data breaches. You get to decide when, where and which devices are to be updated. Remotely. Firmware updates, security patches, system application upgrades and driver fixes are pushed over the air using Wi-Fi/3G/4G as part of this free service. Advanced FOTA is a chargeable service allowing businesses to manage FOTA operations, meaning they can choose which policies to deploy and when. As part of this service, the Software Component Management Object (SCOMO) gives the same control over software updates. 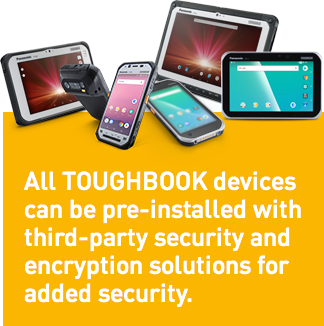 Ensure that your TOUGHBOOK Android devices are fully protected, and device performance is optimised, for the entire lifecycle of your estate, with regular security patches even after product End of Life. COMPASS Security Standard (FOC) – At least 2 updates per year, continuing for 1 year after product End of Life. COMPASS Security Premium (Chargeable) - More frequent patches and up to 10 years support, including support through OS transition. Contact for details. Third Party Security and encryption solutions can also be certified and pre-installed on request, by taking advantage of our COMPASS Manager staging and deployment capabilities. Ensure your Corporate Owned, Single Use (COSU) / Corporate Owned, Personally Enabled (COPE) devices are only used for work using this kiosk mode interface. The Panasonic Enterprise Launcher allows the device to be restricted for single use; for example, only running one or a selection of applications and features for different users. Using the MCL Developer custom business-specific applications can be created and deployed onto devices which use the MCL Platform. Applications designed for the MCL Platform can be deployed across multiple Operating Systems, form factors and device models. Android™ is a registered trademark of Google LLC.